(Clockwise from above) Bowl Bar’s almond mylk, chia seed pudding and Bliss Balls. The Sirtfood diet, with its emphasis on red wine and dark chocolate, is supposed to be the fad for 2016. We would suggest thorough research and medical supervision before the adoption of any diet, but can’t get over the sudden plethora of products in the market that make it so much easier to be paleo, vegan, gluten-free, organic, macrobiotic, or just a person with a happy tummy. Our favourite new picks for the new year. Chia seeds don’t really taste of anything. But set them with a swirl of non-dairy milk, some fruit, nuts, agave syrup, even a few edible flowers, and they acquire a tapioca-pudding-like consistency. “The chia seed pudding is the signature dish of Bowl Bar," says Bowl Bar’s founder Marissa Bronfman. “It is a delicious and nutritious way of consuming chia seeds, a superfood", because it is “incredibly nutrient dense and filled with a host of minerals, vitamins, fibres, good fats," says Bronfman. When Bronfman, who worked with the Huffington Post, moved to India five years ago to start Moxie Media, a digital media agency, she noticed she was falling ill frequently. “That is when I decided to boost my nutrition," she says. “I couldn’t control the pollution level or climate but I could control what I was putting into my body." She had been a vegetarian most of her life, “for animal rights", so switching over to a vegan lifestyle wasn’t that difficult. “I started incorporating these superfoods into my smoothies, sprinkling them on top of my salad, stirring them into my food, and I started feeling the difference right away," says Bronfman. She began posting pictures of her food on Instagram. “The response was overwhelming," she says. “I realized that there was a real niche here. People want to eat healthy but there aren’t enough options." Bowl Bar, which launched last year, retails its chia seed pudding bowls, almond “mylks" and coconut-based Bliss Balls at Eat Thai in Bandra, Mumbai. More locations are on the cards, as is a dabba (tiffin) service, a vegan café and vegan savouries. Currently, her products are around 80% organic, sourced locally and imported. Bliss Balls, ₹ 250 for three balls. A section of Relish Nutrition’s drinks range. Admittedly, a 320ml bottle of Relish Nutrition’s bright-green, cold-pressed vegetable juice isn’t the tastiest way to begin a day. Despite the fruit, mint, salt and spices, the grassiness of the greens lingers. But with almost a kilo of veggies going into each helping, it is a great way to get your vitamin fix. The smoothies, on the other hand, go down easily: The thick, cold organic milk-based beverage may taste like dessert but you can scarf it down without too much guilt. The flavours come from the good stuff: fruit, nuts, dry fruit, nut butters, whey, and cottage cheese. “The idea for Relish came about because the founders (Ganesh and Sowyma Krishnan) lived abroad and started making smoothies in their quest for nutrition in a convenient form," says Vikram Chandrasekar, also part of the founding team and the marketer for Hirsel Nutrition, which owns the Relish brand. Everything that goes into a Relish drink—cold-pressed juices, smoothies, nut milks—is wholly organic, says Chandrasekar, adding, “All our products are made fresh every day and there are no additives or preservatives used in the making." Currently the product is distributed mostly through subscription and door delivery, though some juices and nut milks are retailed at select stores such as Gormei Market and Amma Naana in Chennai. “However, retailing in large numbers, given the limited shelf life of the product, is a challenge," Chandrasekar admits. The drinks are priced at ₹ 1,550 for 12 bottles, ₹ 2,600 for 20 bottles and ₹ 3,100 for 24 bottles. 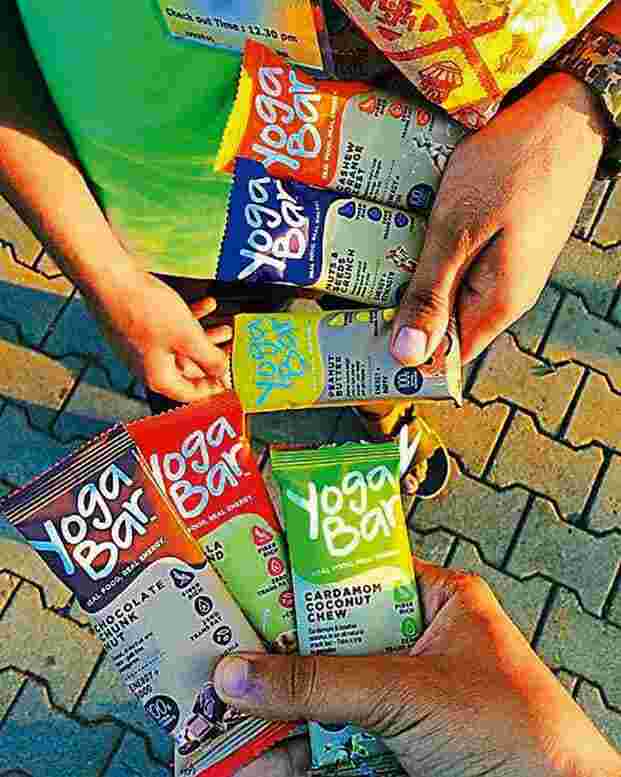 “Yogabars—available in nuts-and-seeds, cashew-orange zest, vanilla-almond variants—are all-natural energy bars," says Anindita Sampath, co-founder and chief executive officer of Yogabars. “Our bars contain oats, dates, cocoa, amaranth, almond, cashew, honey, chia and flax seeds. The nutrition profile of the bar is designed to be a perfect snack bar—about 150-170 calories. The bars are a source of fibre, contain 3-4g of protein per serving, have a good percentage of healthy fats (omega 3, omega 6) and antioxidants. They’re also free from artificial colours or flavours, preservatives, high fructose corn syrup and hydrogenated oil." Anindita and her sister Suhasini were first exposed to energy bars while working in New York in 2014. “We realized during our stint abroad that packaged food can be made more healthy, more convenient," says Anindita. When they returned to India, they decided to create foods like those here. “Our own practice of yoga over the years helped us formulate the core product and brand philosophy, while our exposure to Western markets helped us look at new ways to innovate," says Anindita. According to her, the biggest problem is sourcing. “The food processing industry in India is quite nascent and it is difficult to source good quality and variety of ingredients," she says, adding, “We source our amaranth from Himachal, our cocoa from Kerala, and import our oats." Currently, Yogabars are retailed at outlets such as Godrej Nature’s Basket, Namdhari’s, Amazon, HealthKart, Niligiri’s, Bigbasket, Foodworld, Spar, HyperCity, Health & Glow, Food World and Foodhall. There is also a subscription option available. We’ve all been plagued by the 3pm slump, when the sleepiness and lethargy only seem to respond to a hot cup of coffee with plenty of sugar and two cream-filled biscuits. Or maybe a packet of sour-cream flavoured crisps and a doughnut on the side, with chocolate frosting and sprinkles. That, according to Arul Murugan of Chloroplast Foods (which owns the Snackexperts brand), is the problem with most snacking options today. They are filled with margarine, chemical preservatives, hydrogenated oil, high fructose corn syrup, sugar, artificial dyes and shortening agents, he says. Snackexperts’ range—from Ragi twisters, Bitter gourd crackers and Kodo millet crispies to flapjacks made of seeds and laddoos made with oats and nuts—is “100% natural and the ingredient list is as simple as possible," says Murugan, who worked for seven years with a food processing company before partnering with friends Arun Prakash and Mary Shamla to launch this venture. Because of their limited shelf life—the brand does not use preservatives, colours or artificial sweeteners—the snacks are available only on direct subscription. “The idea is to serve portion-informed, calorie-counted and tasty snacks designed by our experts, directly to the customers," he says. “The products are made to order and shipped fresh to the doorstep." All snacks can be delivered across India (free shipping) and have a shelf life of 30 days. A Smart Snacker Box which contains three boxes of five snacks each is ₹ 1,799. With a macrobiotic diet, the proof of the pudding (or kale, rather) certainly seems to lie in the eating. Singer Madonna, of the sinewy muscle and lissom limbs, is a proponent. So apparently are the undeniably sleek actors Gwyneth Paltrow and Katrina Kaif. However, it can be a complicated lifestyle to adopt. “It is about local, seasonal eating and that is what I follow," Nandi Shah of Re:Store demystifies it, adding that her salads are “perfectly rounded meals with equal amounts of grain, lentils and vegetables. I feel more energetic, active and alive ever since I went macrobiotic." A Japanese version of a macrobiotic diet may have seaweed while a Western version has kale and quinoa. Shah, however, chooses to work only with food that is locally grown and sourced. “Why should I add kale to my salads when there are 100 varieties of spinach so easily available here?" she asks, adding that the principles of macrobiotics could be translated to any culture and cuisine. Pasta, seasonal vegetables (raw or roasted), millets, sesame seeds, chickpeas and tofu find a prominent place in Shah’s salads. A premium range has pears, pomegranates and quinoa thrown in. In addition to her lunch salads, Shah—a graduate from the Kushi Institute in Massachusetts, US, which is a leading educational centre for macrobiotics—also makes muesli and cakes with jaggery, almond and oat flour, nuts and dates to order. Her salads can be picked up from Gormei Market in Chennai. Cakes and muesli on order; muesli is ₹ 1,500 a kilo.